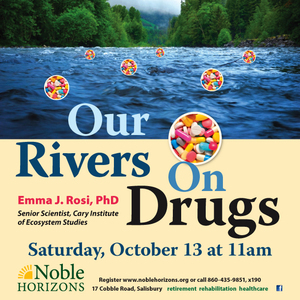 Join Cary Institute ecologist Emma Rosi, PhD, on October 13 at 11 a.m. for a presentation on how prescription and illicit drugs impact freshwater quality, aquatic food webs, the rise of antibiotic-resistant super bugs, and what citizens can do to make a difference. Pharmaceutical pollution can alter the biology and behavior of aquatic life in many ways. Hormonal compounds found in birth control have been shown to feminize fish. Antidepressant exposure can alter fish feeding behavior, incite aggression, and can make tadpoles more susceptible to predation. Cary-led studies have found that antidepressants and amphetamines disrupt the life cycle of aquatic insects and antibiotics shift the composition of stream bacteria. Because the federal government does not require testing and has not set limits for drugs in water, wastewater treatment facilities are not designed to filter out most pharmaceuticals. Further, pharmaceuticals can enter fresh waters directly via failing sewage pipes, sewer overflows, and agricultural runoff. Research at the Cary Institute is advancing understanding of the impacts of pharmaceutical compounds on stream ecosystems through field studies and experiments in its Artificial Stream Facility where they are investigating how stream life is altered by pharmaceutical mixtures, which pharmaceuticals are passed up the food web and how other forms of pollution, like micro-plastics, amplify the problem. Registration for this free program is at www.noblehorizons.org or 860-435-9851.